This was hyped as the episode everyone would be talking about for ages to come, I’m not that convinced. That’s not to say it’s a terrible episode but Demons of the Punjab it ain’t. It Takes You Away is an episode with a lot of merits to it, don’t get me wrong. An interesting tale centred around losing the things you love and having to accept that they’re gone, centred around a young blind girl who appears to have lost both her parents. 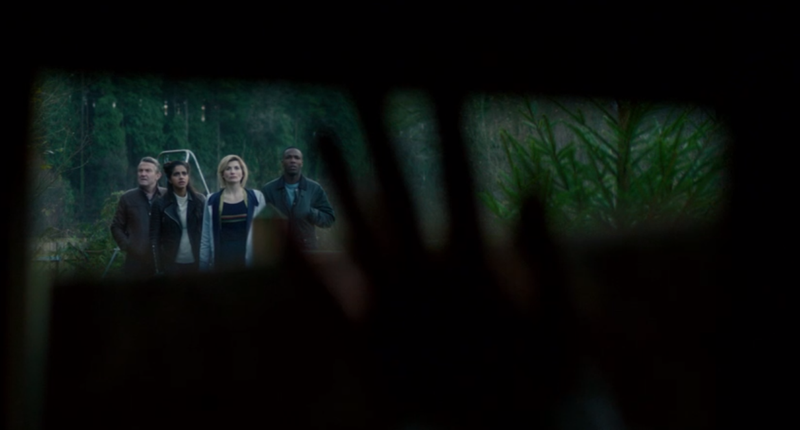 What starts off as a supposed horror, set in a house beset by a monster and containing a portal to a dark realm, soon becomes a completely different tale as the Doctor and Gang find themselves in a mirror world that seems just a little too perfect, with a reborn Grace and who turns out to be the young girl’s deceased mother. Quickly it turns out though that the ominous feeling is for good reason as both women are creations of this other world, revealed to be a sentient universe, used to lure in their partners so the universe itself is less lonely. You really have to lend it to the set design and cinematography teams in this episode as the two versions of reality are set up wonderfully, with the real world a misty foreboding place to the young girl and her father still grieving their loss while the mirror-world is this bright and airy wonderland that feels too good to be true. In between these two worlds however is a dark maze-like cavern that feels suitably claustrophobic and filled with devouring moths that cleanse all who step foot there. The effort put into these aspects of the episode however are never truly matched by the story. While it thankfully avoids easy pitfalls, such as using the girl’s disability for a cheap moment, it does rush through ideas at a breakneck pace to its own downfall. The caves are very quickly forgotten as a threat to the team while the enthralling nature of this mirror-world is quickly done away with as well. Instead it ends with a rather bizarre, almost Python-esque moment where the universe itself is represented by a frog on a chair with Grace’s voice. Hardly the most ribbiting foe the show has come up with. The conversation that follows, with the Doctor convincing the universe that it needs to let them go to live, is an interesting one but the whole set up is rather attention-diverting. Along this line there are a lot of great character moments this episode, in particular those that feature Graham. His inability to let this new version of Grace go, even as she becomes more selfish and controlling, is beautifully acted by both and makes you wish that it didn’t end the way it does. The only sequence that trumps it sees Ryan finally accepting Graham as his “granddad” that leaves Graham suitably moved as the episode ends. Yaz and Thirteen moments though are rather fleeting (though a scene where the two hold hands and the Doctor pushes her to sit on a bed have obviously pleased some parts of the fandom), with Yaz in particular feeling the weakest of the characters once again. It’s a shame really as all of the cast are great but the three companions is at times a bit too crowded for guest writers to exploit fully it seems. At the end of the day though the two sides of this episode make it feel rather meh overall, as the great character moments and potential are routinely diminished by a rushed script that goes from mystery to horror to sorta romance that leaves you wandering if the lack of two-parters this series was really the best choice.